In March 2019, Red Hat announced that the Red Hat Learning Subscription (RHLS) free trial is live. TL;DR: this article is aimed at anyone studying for RHCA but without the capacity of buying a RHLS. The free trial provides you with instant, self-service access to the entire Red Hat training portfolio. Visibility into the RHLS is available to anyone who activates the RHLS Free Trial. Just 1 hour of hands-on lab access you might ask? I know, this part is a bit of a joke, because half of that time is consumed to provision and start the lab. Anyway, that’s not what I wanted to talk about today. Read on. The free trial of RHLS is good news for everyone who’s studing towards RHCA, but who cannot afford to buy RHLS. If you read this blog, you probably know that I’m a self-taught RHCE. From my exprience, there are so many RHCSA/RHCE study resources available to choose from that it all comes down to your personal preference. Whether you want it free, paid, online, on-site, 1-to-1 instructor-led, video, it’s your choice. This isn’t the case for Red Hat’s Certificate of Expertise (CoE) exams. When I was looking for the RHCA level study guides three years ago, I didn’t find much. In fact, I was unable find any non Red Hat training course that would comprehensivelly cover all exam objectives. I’d like to point out that the situation is actually getting better, Sander van Vugt has several RHCA courses, there are other providers available as well. 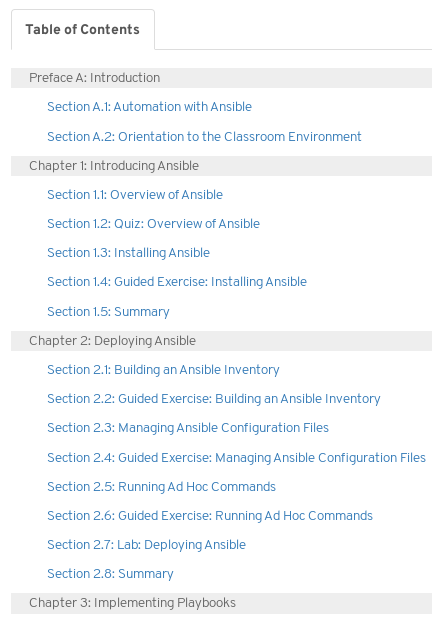 The biggest benefit for candidates aiming at RHCA but without a RHLS is the fact that you can now see the table of contents for all Red Hat training courses. It’s not a secret that Red Hat training is designed with the exam in mind. If something’s not on training, then it should not be expected on the exam. Three years ago I had to rely on the official exam objectives to come up with a study plan. Now I can tailor my studies based the table of contents for the course, and that’s available thanks to the free trial of RHLS. If you cannot afford to use the official training material offered by Red Hat, then at least you can create your personal study plan to match it, and use product documentation. You will know that what you studied is the core of the exam. Good luck! This entry was posted in Notes and tagged RHCA, RHLS, RoadToRHCA. Bookmark the permalink. If you notice any errors, please contact us. This is a great idea! I have my EX407 booked for May 6th and just signed up for the free trial of the RHLS. Looking over the table of contents for the course turns out to be a nice way to be sure that you’re studying the right topics. Think I’ll go through and take note of the table of contents for any other courses that look interesting before my free trial is finished. My point exactly. Take screenshots of any courses that you intend taking in the future. I’m sure it will come in handy later!